Writing the perfect resume can seem like a daunting task. With the average resume being only one or two pages long, how do you choose what to include and what to leave off? Think of it this way; your resume should only include information that correlates with the job you are applying for. That means each time you send in a resume; you want to make sure it highlights the skills you possess that can benefit that particular company. Objective statement – There’s no need to add an objective statement at the top of your resume. If you want to write about yourself so the hiring manager can get a glimpse into who you are, then include your objective statement in your cover letter or application email. Unrelated work experience – If you’re interested in applying to a specific company, pay attention to the necessary requirements and responsibilities that are listed. If the bullet points on your resume don’t pertain to something from that job posting, leave them off. And yes, that means if you’re serious about getting hired, you cannot send out the same exact resume to every employer. Education information – Unless you recently graduated from college, there’s no need to add your college GPA and graduation year. The accomplishments won’t affect your job performance and are actually less appealing to employers than the expertise you obtained in the workforce. 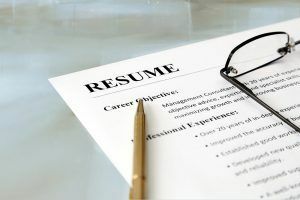 Out-of-date skills – Make sure all of the skills you have on your resume are current and relevant to the position. Jobs longer than 5-10 years – Most likely, the jobs you had at the beginning of your work career have nothing to do with the jobs you’re applying for now. Also, if you’ve held a single job for 5-10 years, limit yourself to including only four previous work experiences. Typos – While this seems like a given, many people overlook grammatical and usage errors, so make sure to proofread several times. If you’re worried you won’t catch your mistakes, then ask a friend to double check your resume for you. Inappropriate email addresses – Again, another obvious one, but you would be surprised at how many people use their personal email address from high school as a point of contact in the professional world. Keep your quirky email address to use with your family and friends and, for business purposes, sign up for an email account using your first and last name. Now that you have an idea of some of the information you should leave off of your resume, you should have no problem impressing employers to get an interview. Another step you can take to getting the job you want is by connecting yourself with the people who have the knowledge and experience to guide you in the right direction. From building your resume to how to dress for an interview, working with the right mentors can help you overcome any challenges that may be keeping you from pursuing your career goals. As a student in our LifeWorks training course, you will have access to the resources you need. Our educational partners provide specialized short-term training and job placement in some of the hottest in-demand careers in Central Florida. If you’d like to sign up for our no-cost LifeWorks program, please contact The Jobs Partnership by calling 407-641-0755 or apply online.